Will.i.am hopes his donation of £500,000 to the Prince's Trust could help find the new Mark Zuckerberg among the disadvantaged children from deprived areas of London. The Black Eyed Peas frontman said there was musical creativity in neglected inner city areas around the world and suggested it could be channelled into developing the next internet sensation like Facebook, co-founded by Mark Zuckerberg. Will.i.am made the donation after meeting youngsters on a Prince's Trust personal development course in east London last month and holding talks with Charles at Clarence House to discuss how his Foundation could support the Prince's charity. The money, given via the performer's i.am angel Foundation, will help build skills for work and enterprise, with a focus on technology. Speaking at the Trust's London headquarters, after the donation was formally announced by its chief executive, Martina Milburn, Will.i.am said: "It really takes one person from east London or Brixton to turn into Mark Zuckerberg." The Voice star added: "How come people from inner city areas can't come up with things for people that connect (them)? "Every single creative thing in music came from people from inner cities, creativity is thriving there. "They're not given the tools to become the Zuckerbergs, they're not given the tools to become the Jack Dorseys, Twitter, they're not given the tools to become the Larry Page and Sergey (Brin), Google." 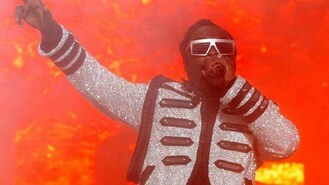 Will.i.am added: "I grew up in east Los Angeles, one of the most under-served and tough neighbourhoods in America. My family made sure I understood that getting a good education and hard work were key to turning my dreams into reality. "So I am pleased to be collaborating with an organisation that shares my mission to transform the lives of young people who need extra support and structure in their lives." Pete Waterman is to be reunited with his Hitman And Her sidekick Michaela Strachan when she co-hosts an outdoor celebration of his music. Justin Bieber has revealed a duet with One Direction is on the cards. Tori Amos has announced a one-off show at the Royal Albert Hall. Katy Perry has revealed she broke down in tears moments before going on stage as she struggled with her marriage problems. Louis Walsh has admitted there will "be tears" this weekend as Westlife bow out with a farewell show in front of thousands of fans. Radiohead plans to reschedule nine shows after a stage collapsed, killing a British drum technician. Jude Law has hosted a concert marking the opening of the London 2012 festival in Londonderry. Indie rockers The Charlatans have played an exclusive gig on a tiny fort in the middle of the sea as a warm-up for the Isle of Wight Festival.